1In a small saucepan, place the chocolate and butter over a low heat, then stir until melted. Stir through the 3 egg yolks before setting aside. 2In a separate bowl, whisk egg whites to soft peak. Add in a tablespoon of sugar and whisk to stiff peak. 3Fold the egg whites through the chocolate mix, then the cream. Put in the fridge until set (minimum 3 hours). 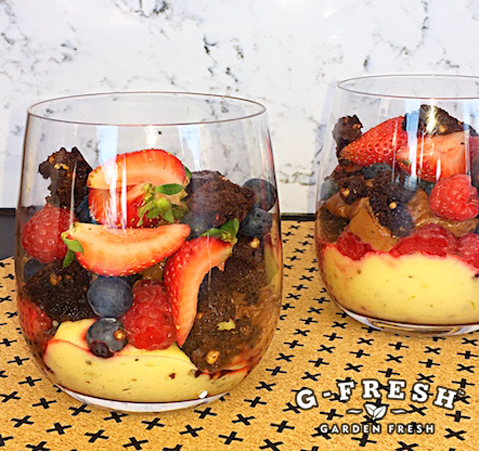 4Serve in a glass with crumbled brownie slice, lime curd (which can be purchased from Romeo’s Foodland and other independent supermarkets) and mixed berries.